Anyone familiar with the "farmhouse" interior design may already know that a major indicator of that style is the use of decorative dishes. Anyone familiar with the "farmhouse" interior design may already know that a major indicator of that style is the use of decorative dishes. Accent pieces with color may appear from time to time, but most farmhouse stylists understand that where dishes are concerned, a large array of white patterns sets the stage for the styling. The dishes or dishware you choose can really make your chosen style "pop", but it can also be used to define the entire theme. After all, this is something that restaurateurs have been doing lately, and rather than filling spaces with art and décor, they may rely mostly on ceramics and dishware instead. Let's look at the use of dishes as décor in the home and then explore a few contemporary examples of restaurants that convey their message through the dishes in which they present their meals. Dishes sit in cabinets and are put to use as we cook and eat. We don't often consider the kind of work, skill or effort that has gone into designing these multi-functional tools. Fortunately, this is starting to change, and the increasing use of French-style wall racks where dishes are on display are seen in more kitchens, which proves that more of us recognize this as an element of home décor that deserves more attention. In fact, if displayed properly, we can find distinct styling elements from something as basic as our dishes. How can you actually incorporate designer dishes into your décor? Something as simple as a wall rack or open hutch (where dishes face outward rather than in profile) will allow you to use them as a showcase. This can make their color the key part of a room's palette. For example, a neutral or pale dining room or kitchen using a wooden or darkly stained hutch or wall rack can be loaded with dishes in a much deeper saturation or bolder hue. 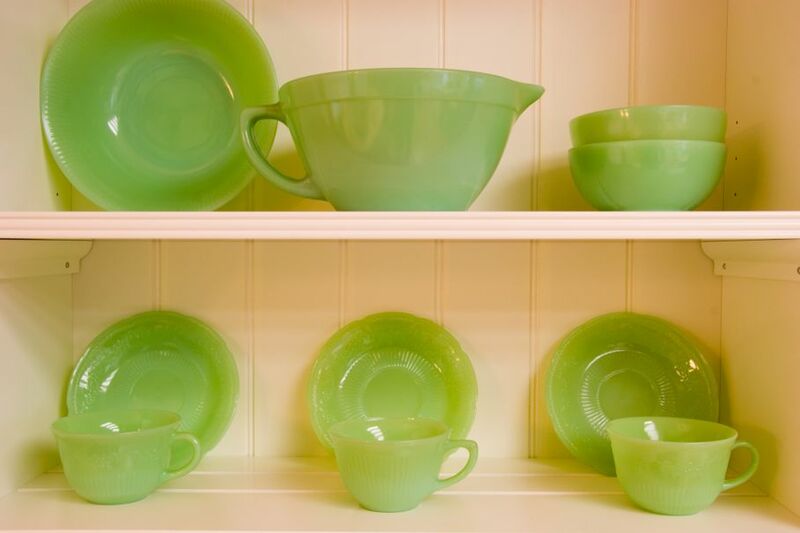 For this illustration, let's say you have a wonderful array of deep green lettuce ware (dishes that feature a texture similar to cabbage or lettuce leaves) and other pottery in coordinating hues. Tucked into the hutch, they suddenly become art piece and can really energize the setting. You can also begin to use your larger pieces as functional art too. Utilizing items for an interior design that also have a functional purpose, like dishes and mason jars, is a popular home trend. As far as plates and dishes are concerned, you can simply hang them from sturdy plate and platter hangers and arrange them in a display until you need to pop them down for use. 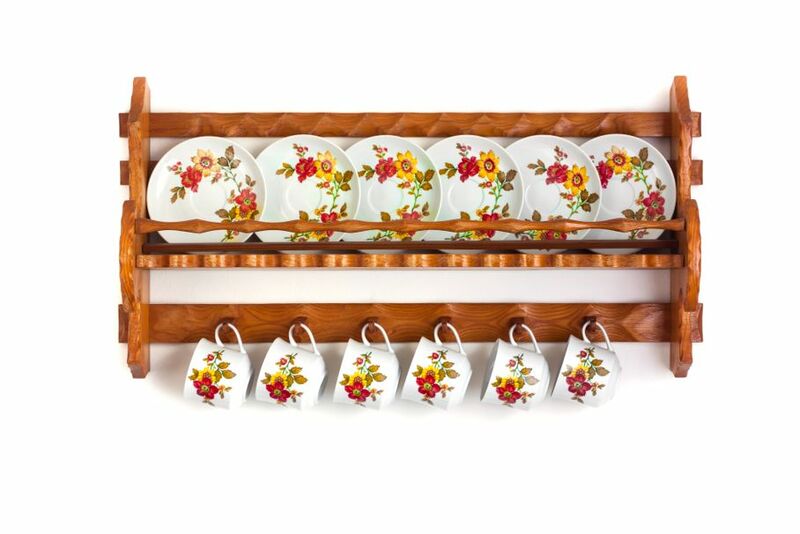 Floating shelves or brackets also display these items beautifully and are easily in reach. 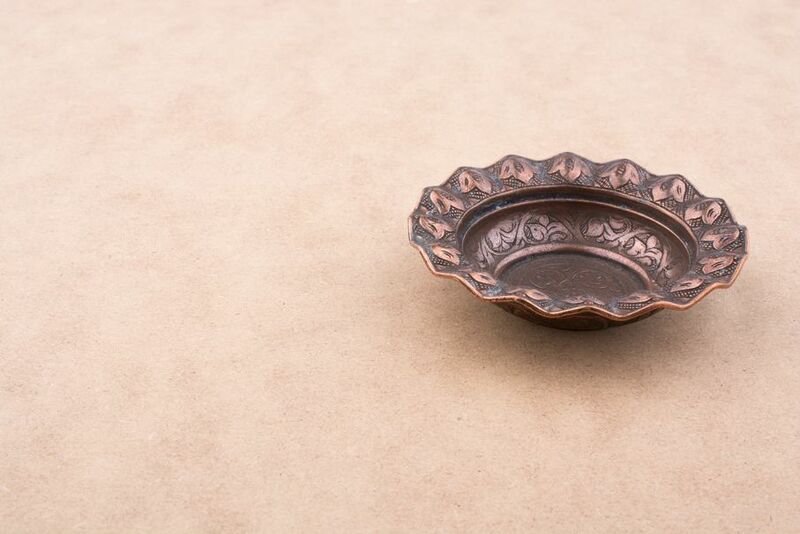 Some clever homeowners are using metal dishes in alternative ways as well. While they do make excellent wall art and may substitute well for a mirror that reflects light back into a room, don't overlook their use as a backsplash (hung from durable hooks behind a faucet area or a counter space), as utility items such as soap dishes or flower pots, and larger items are ideal for bathrooms. For instance, your oversized serving bowl can hold hand towels in the otherwise plain guest bathroom, or your pewter tray would be a nice bit of functional art to hold keys by your front door. Whether you use them to communicate your chosen style or as smaller accents that help to complete the expression of your theme, plates of ceramic, fine china or even sturdier materials like pewter can really step in as functional art and décor. Decorative dishes also work well in restaurants and other professional settings. A cookbook published in 2014 demonstrated this when it displayed the stoneware bowls of New York potter, Jono Pandolfi. They are made of white stoneware that is left unglazed on one side and glazed only on the serving surface, they also feature bursts of color that frame or accent food. His pieces appear in some of the top restaurants of New York, including The NoMad, Eleven Madison Park, wd-50 and Atera, among many others. A graduate of the Parsons School of Design, he created his unique take on professional-grade dishes by combining handmade techniques with large-scale production. Pandolfi meets directly with restaurant chefs to talk about the specifics of dishes including color, style, shape and placement in order to enhance the look of the food. He says, "It's more about working with the chef to understand their aesthetic." He demonstrates that food style is gaining ground over mainstream décor as a restaurant's way of expressing style. 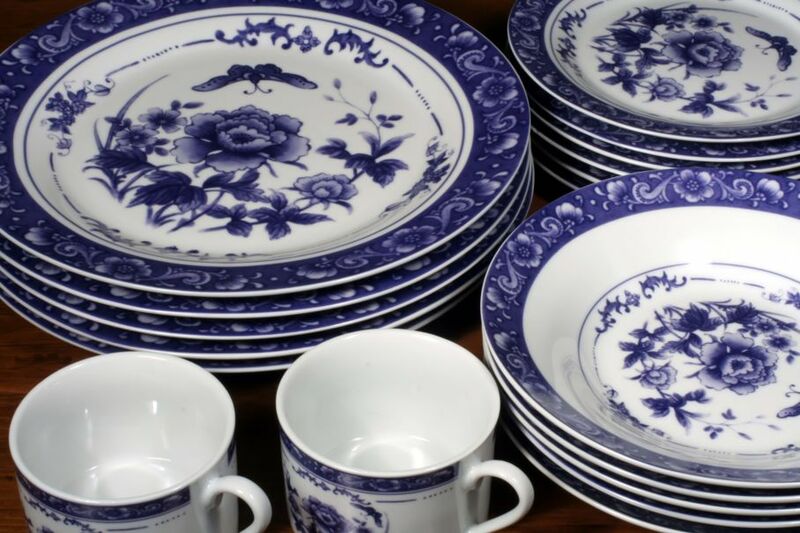 As you begin any sort of décor project, consider the use of something as essential dishes and crockery. They convey more than just color or function and can become a major component on the walls, counters, and table.